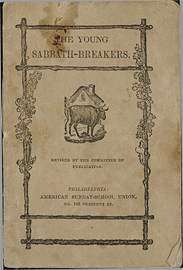 The young Sabbath-breakers / revised by the committee of publication. Undated. Date range from publisher's address at 146 Chestnut St., cf. 19th century American children's book trade directory WWW site. First sentence: "The village of B---- stands on the bank of a lovely lake." text.chapbook.black and white, 11 cm.